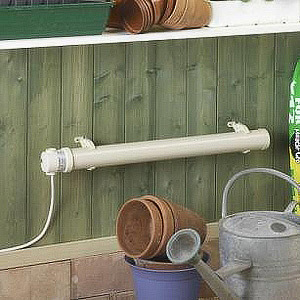 Tube Heaters are designed for applications that require low cost, steady background heat such as Greenhouses, Garages, Workshops, Conservatories, Sheds, Boats, Airing cupboards, Pet enclosures, Caravans and Lofts. They are an ideal solution for frost protection & to prevent condensation and are IP54 water proof rated. The aluminium construction makes them rust proof & more energy efficient. Optional guard and plug and lead sold separately. They can also used for snooker table slate heating to "improve ball speed" (approved by the professionals).